HomeWhy a Mom’s Big Year? We’ve all got ‘something’, right? Something that’s happened in the past or something that is currently in our lives that we carry with us every single day. Perhaps it’s an ill family member, a struggle with addiction, the death of a loved one, a dysfunctional relationship, or a family tragedy. It’s what we do with that and how we think about that ‘something’ as we wake up in the morning and face the world, that makes us who we are and sets the tenor for our day-to-day being. I’m a mom, who’s got ‘something’. On January 4, 2002, my family experienced an unthinkable tragedy. 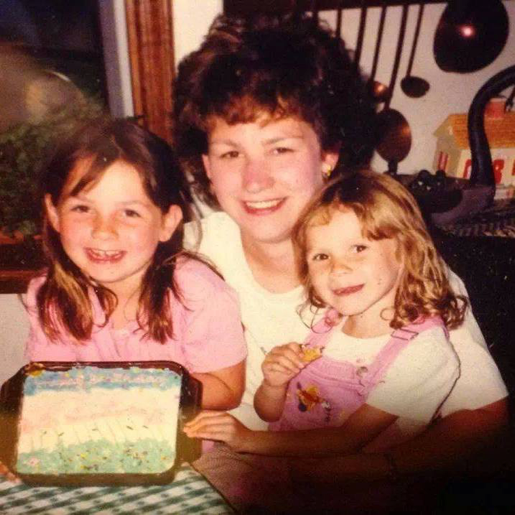 My 38-year-old cousin, Diana, and her two young daughters, Kristy (age 9) and Jenny (age 6), were all hit and all killed by a car while they were walking on the sidewalk on the way to school. The driver that hit them passed out at the wheel due to an ongoing medical condition. The details of the accident are unfathomable. Diana & I were very close. She was like a big sister to me. She’s in almost every photo with me in my baby book. She was there for every holiday, every birthday, every life event. This wasn’t supposed to happen this way. In the context of a very small family, Diana and I always knew that the two of us would be the ones to carry on these family traditions once our parents and grandparents were gone. Now, life without her and her beautiful daughters is so much different than I ever could have imagined. The post traumatic stress from the accident has caused me to have severe anxiety related to driving… I’ve developed a phobia of ‘passing out’ while driving…just like the driver that hit and killed our girls. It must sound silly to anyone who’s never experienced something like this. It was hard for me to wrap my mind this phobia when I first experienced it. Now, in case you don’t know me well. I’m not a wimp. I ski black diamonds, do rock climbing and repelling, scuba dive down to 100 feet, swim with hungry sharks, cuddle with snakes, and will let a tarantula walk on my face. All of the above… NO problem! That said, I’m sure you can imagine how frustrating it is for me not to be able to do what millions of people do every day. At this point I cannot drive through a tunnel, over a bridge, or on many major highways without experiencing lightheadedness, tingling in my arms and legs, and tunnel-vision as if I’m going to pass out. It just doesn’t make sense. It’s paralyzing to me and is making my world smaller and smaller. My plan is to use birding as my incentive to tackle these tragedy-induced fears throughout the year as I head out to my destinations for my Mom’s Big Year. On the practical side, while traveling, I will need to be able to fly in to a city, rent a car and drive myself to my target destination. This task right now seems impossible to me. On the emotional side, I know this is not going to be easy. But I do know I need to simply stare this monster in the face to eliminate it. Using birding as my ‘carrot’, I plan to address this gradually and to the best of my ability. I expect to have leaps forward and many steps backward. I am hopeful, however. I find birding extraordinarily healing… as it takes me back to a simpler time in my life….a time when I had the freedom to travel hours on end to chase a snowy owl, to pick through gulls with a fellow birdnerd, to sit and soak in the joy of seeing the first dark-eyed junco of the winter. The feelings that birding generate for me are extremely soothing and at the same time very empowering… empowering enough, I hope, to heal the wounds that remain after such loss.